Host with the Most. Cruise Director. Soiree Boss. Football Fun House. These are all possible nicknames you might get if you win The Peterson Chevy Big Game Giveaway. We packed it full of items you might need for the biggest Sunday in February and all you have to do is take a test-drive to have a chance at winning! 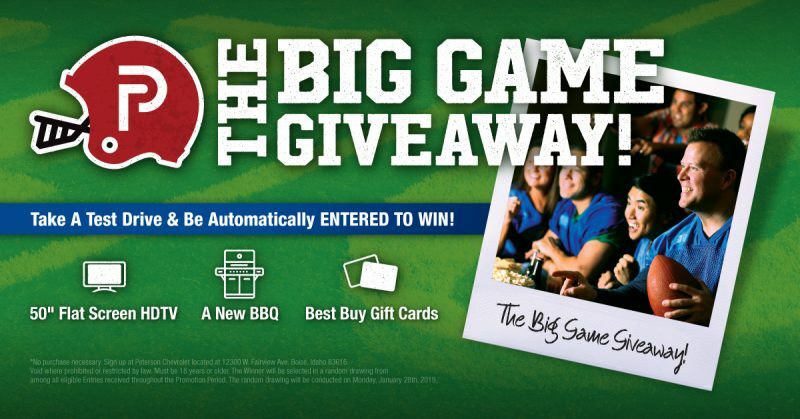 That’s right, take a test-drive between 1/24-1/26 2019 during our New Year Sales Event and you’ll be automatically entered to win an HDTV, Best Buy gift card and a new stainless steel BBQ. It’s also a great way to spruce up the She Shed or Man Cave. The odds of winning are really good so make sure you swing in, take a test drive and get signed up. We’ll draw the winner on Monday, January 28th to give you time for set up! TFL Reviews The 2019 XT4.